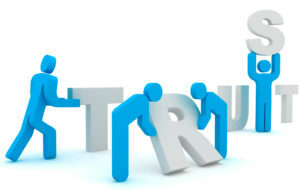 Trust - Find a Property Manager that makes that a priority! Home | Who can I trust? Whether you want to be hands-off or know every detail throughout the leasing cycle, demand that all information be available to you around the clock. You should be able to know 24/7 what is happening with your properties—marketing activity, applicants, tenant changes, rent status, maintenance needs and overall property condition. Real Property Management Salt Lake provides on-demand online reporting on all activity and financial reports, as well as responsive support through your property manager, accounting and maintenance representatives. Your property manager should clearly explain the terms of your agreement, what is included in the management of your property and what you can expect at each stage of the leasing cycle. A professional property manager will be happy to take the time to answer all questions to your satisfaction. Real Property Management Salt Lake explains everything up front and helps you know what to expect throughout the process. A leasing fee and a monthly management fee are standard in the industry, and all costs should be clear up front. Remember, do-it-yourself and discount property management services can cost you in the long run in longer vacancy times and costly mistakes. When fees are waived or reduced, too often the level of service for your investment is reduced as well, which can hurt your returns. At Real Property Management, we are committed to clear pricing, no hidden fees and the highest level of service. Property management is an unregulated industry, so it is especially important to ask about your property manager’s training, experience and certifications. At Real Property Management, we are held to a higher, national standard of performance. You shouldn’t settle for anything less. You have a right to ask for references—who else uses the property manager? Don’t cut corners when entrusting your investment property to a management team. Real Property Management is trusted by thousands of individuals, investors and institutions across the country, including Freddie Mac, Fannie Mae, Chase Bank and several more of the nation’s largest banks and mortgage servicers. While it’s true that some property managers may give the industry a bad name, remember that real, professional property management always means high ethical standards, experience and quality service. Read more about how to choose the right property manager here. Find answers to more of your questions in our Education Center here, as well as our video library! Click Here to contact Real Property Management or fill out the form below.